Michael and I spent Saturday afternoon at the Applecore Backyard Festival with some friends. The relaxed atmosphere and discovery of some great unfamiliar bands were obvious highlights, but we were also pretty chuffed that we avoided sunburn entirely thanks to some huge, cheap Big W hats. Even so, we were a little drained as evening fell and in need of some sustenance before heading home. We'd spent the day grazing on vege sausages-in-bread and BBQ shapes and had very different ideas about what we needed to eat next. While Michael and Mike originally suggested pizza, Toby was keen on Coco Loco, and since I was fighting from the Sweet Stuff corner I readily agreed with Toby. Toby assured us that Coco Loco sells savoury crepes and this is true. However this restaurant's love of sweet luxuries is written and illustrated all over the menu. There are pages and pages of chocolate truffles, cocktails, hot and iced chocolate and coffee beverages (liquor-shot by request! ), waffles and other desserts competing against a modest offering of 4 savoury crepes. (Even one of those contains chocolate!) Our incredibly cheerful waiter also rattled off a handful of additional specials, his enthusiasm not diminishing as he repeated them for our late-coming companions Mike and Kristy. It wasn't in vain - I took him up on the drinks special, a mocktail involving hibiscus, ginger, vanilla, pineapple and coconut (~$13). It was just the refreshment I needed, with a nice gentle ginger burn in the back of the throat. Michael chose the Kama Sutra crepe ($15), which was stuffed with Indian spiced roasted pumpkin and fetta cheese. It was richly flavoured with cumin and went down a treat. While the menu is a little inconvenient to navigate, vegan and gluten free options are clearly marked. Our waiter of the evening deserves another positive mention - he was utterly good-natured in the face of our embarrassing disorganisation and social lingering. I believe everyone around the table was well satisfied by their meals - these aren't everyday-eating prices but then, these aren't everyday-eating dishes. Read about our previous visit to Cocoloco here. There'll also be plenty of time to socialise and eat with fellow food bloggers. Participation is free but places are very limited. If you'd like to attend, fill in this form to register and cross your fingers for an invite! 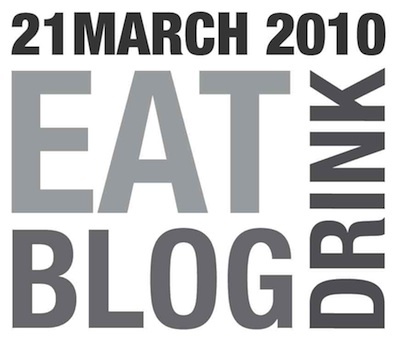 Keep up to date with the conference by checking out the Eat Drink Blog blog. A lot's been happening at Lord of the Fries since we last wrote about them. Their empire of vego junk food has expanded to Melbourne Central, Northland and Chadstone and their menu's been extended too. We stopped by the Melbourne Central outlet on Sunday afternoon for lunch. You might have noticed the most short-term of their changes in that picture up top - throughout February, you can get wasabi mayo on your chips ($3.95 chips + $1.25 sauce)! This concept pleased me no end, though unfortunately the execution was less impressive. I couldn't detect any wasabi in my mayo at all, not even the faintest tickle. Oh well. Their straight-up Belgian mayo is one of my favourite classic sauces, anyway. It seems the burgers now come in three sizes (with a 'mega' version now on offer for $7.95), and there's the new Lord's Chicken burger ($5.95)! The vego chicken patties nestle in a bun smeared with mayo, mustard, lettuce and cheese. Michael's ambivalent about this innovation but I'm all over it - the 'chicken' has a nifty chewy texture, a faint hint of the Colonel's secret herbs and spices and I dig those creamy condiments. My only quibble would be with that fairy floss they're calling a bun. Even when I'm scoffing junk food, a little fibre wouldn't go astray! Like the 'beef' burgers, this LOTF branch does hotdogs ($5.95) in original, spicy and big mark varieties, and Michael went spicy. If you've had a vege hotdog smothered in sauce, then you know exactly what to expect and this was precisely what Michael was after. I hear they didn't flinch on the hot sauce either. That was enough to stuff us to the gills, but there are still more novelties to be had - we saw Mexican soft drinks and vegan cookies and brownies here too, and down at the Lord's on Flinders St you can buy La Panella's sublime pies and sausage rolls (at an insane markup). It's all a bit much for a vegetarian junk food junkie to take in! However, not everything is yet available at every store. So front up to the nearest one and take your chances. What's the worst that could happen? A fallback cup of their chicken nuggets is hardly a disappointment. Read about some of our previous LOTF visits here, here and here. Not having made dumpling skins before, I anticipated that Michael's Chinese New Year potluck preparation would be a bit of a challenge (though I didn't imagine quite the debacle it became!). I figured that if I was going to supply something sweet it'd best be made in advance - a perfect excuse for icecream. I know icecream's not exactly traditional CNY fare but there's this funny-looking orange-Szechuan pepper recipe in David Lebovitz's Perfect Scoop that I thought would make a nice twist on the theme. Of course, it being a David Lebovitz recipe, it was chock full of eggs and dairy and involved lots of pans. I shrank down the steps, using creamy soy cooking milk (analogous to evaporated cows' milk) and some arrowroot as a thickener. This no doubt changed the taste and texture of my icecream but not to its detriment - the orange and Szechuan peppers were certainly bold enough to mask the soy. They're so bold that a little scoop of this icecream is more than enough. The orange hits you straight up with its sweetness, acidity and a little bitterness before the pepper is unleashed in the back of your throat. It's quite the palate cleanser! In a medium saucepan, stir together 1 can of the milk, the peppers, orange zest and sugar. Continue stirring the mixture over low-medium heat until the mixture is hot and the sugar is dissolved. Stir in the arrowroot, take the mixture off the heat and rest it at room temperature for an hour so the flavours can infuse. Strain the mixture into a bowl - I used a fine sieve lined with muslin to squeeze through as much liquid as possible. Whisk in the second can of milk and refrigerate the mixture until very cold. Churn and freeze it using an icecream maker, according to the manufacturer's instructions. On Saturday night Steph and D gathered a large crowd of potluckers together to mark Chinese New Year (blog posts thus far from Vicki and Steph, twice!). This was the first potluck we'd had since Kristy had her Coeliac diagnosis, so the general theme was Chinesey and gluten-free. Aha, I thought - I'll make vegan, gluten-free dumplings. What could be more delicious? My research quickly turned up the fact that pre-made dumpling wrappers are all wheaty, so I resorted to making my own dumpling skins. The recipe comes via Jill at 'Hey that tastes good' and is pretty simple: just combine a bunch of non-wheat floury things together with a bit of oil and water and you've got your dough. A bit of rolling and some circle slicing and you're ready to steam yourselves some gluten-free dumplings. Which require some sort of filling. In my focus on the dumpling skins, I hadn't given much thought to what we'd put inside them. Cindy found this recipe, which required a bit of veganising - I almost used TVP instead of pork mince but at the last minute realised it wasn't gluten-free and went with tofu instead. And then I just poured the soy sauce in. Soy sauce, for the uninitiated, is made with wheat. Wheat is chock full of gluten. I am an idiot. By this late stage there was no time to start the filling again (we still ended up half an hour late), so my 'gluten-free' dumplings ended up being inedible to their intended audience. Very disappointing. The dumplings themselves turned out okay. The skins were pretty dry and unappetising after they'd been steamed, but a quick spin in the frying pan at Steph's place improved them immensely. I was too disconsolate to really enjoy them, but Cindy reported reasonably high approval levels from the non-coeliacs at the potluck. Note that the recipe below is designed to make heaps of dumplings - it could easily be halved. Mix together the three dry ingredients and then add the oil and water, mixing until things get doughy. Roll the mixture into a ball and cover. We refrigerated at this stage, but you can just leave it to rest for half an hour or so. Fry the onions, garlic and ginger in the sesame oil for about five minutes, until they're nice and soft. Add the tofu and cabbage and stir-fry for another 10 minutes or so. Stir-through the tamari and sherry, along with the bamboo shoots, salt and pepper and cook for five more minutes. Leave to cool for half an hour or so until you're ready to get dumpling folding. Flour up your counter (rice flour! Don't mess it up now!) and roll out small chunks of your dough (see above). Cut out circles the width of a Goulbourn Valley peaches container lid. Put a teaspoon or so of filling in the middle of each circle (don't overfill, it's tempting but foolish) and gently fold them closed, wetting and pinching the edges to keep things together. Repeat until you run out of dumpling skin or patience. Steam the dumplings in a bamboo steamer for ~ 15 minutes and then lightly fry on one side in sesame oil before serving. If you've got this far without trying to poison one of your friends: well done, you've made delicious gluten-free dumplings. Otherwise: spend half an hour having a complete sook before buying some consolation mock-meat for said friend which, it turns out, probably isn't gluten free either. Then cry. I love masala dosai, though I don't eat them often. This packet powder requires only water, a stir and a brief rest before you can get frying. I'm a little clumsy when it comes to fry-and-flip items like pancakes and burgers, and these dosai were no exception. Even though the batter was thick, there were breakages every time. On the second night that we made this meal I doubled the quantity of water, hoping for a thinner, crispier dosa like the ones I've eaten out. There were inevitably even more breakages. My technique needs a lot of improvement but these nevertheless tasted great and I won't hesitate to buy this again and practise, practise, practise. I improvised my own potato stuffing, basing it on Lucy's Indian spiced potatoes. I added a finely chopped onion in to fry at the start and finished them off with a splash of tamarind concentrate. They were marvellous. The Curry Tree spice mix was even easier to prep. The vacuum-sealed spice mix goes into a saucepan with a can of drained chickpeas and some water; simmer for 10 minutes and it's ready. Naturally it's not as complex and tasty as a homemade chickpea curry but it is rather good, easily the best 'instant' product I can remember buying. The ingredients list consists entirely of foods I recognise, from onion and sunflower oil through to mango powder and turmeric. No three digit numbers to be seen! This, I like. Though our meal was riddled with ghee, this could easily be replaced with vegetable oil. Both packets are free of animal products so they get a vegan-friendly tag from me. When my enthusiasm for silverbeet was waning, you guys got me sorted. I was so pleased with the meal ideas you left on that post that I was actually counting down the days until the next silverbeet delivery! During those chard-less days I received another recipe suggestion via email, from Michael's mum Robyn. Well, folks, she's my mother-in-law, so I figured I'd better give it a shot. Ha! Actually, it looked like a good one - a quiche-style dish with a pastry made mostly of mashed potatoes. Now, a mashed potato 'pastry' is usually the kind of thing that would have me suspicious. Shortcrust pastry is almost sacred to me. But Michael and I had this dish we used to make pre-blog, with a grated potato crust and broccoli-quiche-kinda filling, so I knew this had promise. I just didn't read the recipe closely enough before we started. Michael set to boiling and mashing the potatoes a little late in the evening and it was only then that I noticed the 30 minutes required to rest the pastry, the 40-50 minutes to bake the pie and the subsequent 20 minutes that the finished pie allegedly needed to rest. (I knew it'd take a while to bake but, really, did it need all that lazing around?) So Michael made the potato dough, popped it in the fridge and we got dinner delivered. This was a good decision. Our delivered dinner was marvellous, and the pie prep got even more involved than the recipe predicted. The potato pastry was mushy and challenging to mould, even when I tripled the flour quantity, and the pie just would. not. set. It spent at least an hour and a half in the oven all up, and got its post-oven nap twice over - still the crusty walls buckled when I loosened the springform pan, with cracks oozing mashed potato and threatening to unleash an eggy avalanche. Dinner was messy but tasty, and lunch was better - a night in the fridge firmed everything up nicely and it even withstood a solid microwave heat-up at work. Naturally, that picture you see up top is the well-behaved post-fridge version of this pie. I've since had a chance to consult Robyn on our approach and not come up with any glaring mistakes. She thinks we could potentially up the flour quantity even further, while I'm plotting a pastry pre-bake to firm those potatoes right up. In the recipe below I'll record what we did (with a couple of asides) and, if we do something better next time, you'll be the first to know. It's the least I can do for you crazy silverbeet lovers. Peel and chop the potatoes, then cook them in boiling water until tender (about 15 minutes). Drain the potatoes and mash them thoroughly (you don't want lumps!). Add the butter and flour and stir everything together until it's firm enough to form a ball (you may want to add more flour). Refrigerate the dough for at least 30 minutes (we left ours for a full day). Preheat the oven to 180°C. Roll the dough out between two pieces of greaseproof paper, large enough to fit a springform tin (if you don't have one, I'm sure you can use a pie or casserole dish or cake tin). Remove the top sheet of paper, then ease the bottom sheet and the pastry into the tin and gently shape it to form a crust. Although I did not do this, I would suggest pre-baking this crust until lightly golden - maybe 10, 15 minutes? In a bowl, whisk together the eggs and cream, then stir in the cheeses, silverbeet and nutmeg. Season it as you like and pour the mixture into the potato crust. Bake the pie until it's set - this will probably take an hour and possibly longer. Allow the pie to cool in the tin for 20 minutes before slicing and serving. Late, late, late. Late to discover Pearl Oyster, embarrassingly late to join my companions on this Sunday morning, and later still to blog the experience. But when the cafe's this cute and tasty, it sure is better late than never. Once I did finally join Lisa, Kristy, Toby and Michael I had to choose my breakfast quickly. There was granola, then lots of toast - with spreads, lots with eggs, decorated with hummus and dukkah or pickled ginger as well as some more traditional sides. There was French toast, with rose honey, raspberries, pomegranate seeds, pistachios and double cream. Hot and flustered and surprisingly not very hungry, I went back to the granola, which promised almonds, vanilla yoghurt and apple cherry compote ($8). It sure was a pretty plateful when it arrived. The plums were beautifully sweet and juicy, and the almond granola was just, well, sweet. Within just a minute or two it soaked into the milk, turning it a caramel colour and flavour. You've been warned - this is one sweet cereal! The majority of those round the table ordered one of the day's specials, cumin-spiced scrambled tofu with a pear and walnut salad ($16). It scored high points all round, and hope that it might earn a more permanent spot on the menu. Pearl Oyster's yet another example of the northside's excellent brunch culture - it has a charming fit-out, the staff are friendly and attentive and the menu accommodates a range of tastes and dietary requirements.